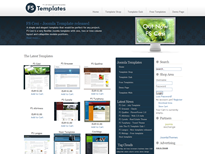 FS Templates have released a new theme on top of creating a brand new look for their own website this month. Cesi, is a simple and elegant theme with eight fully collapsible module positions, is built without tables and works on Joomla 1.0.x. The thing is, at only 10 it's less than what you'd spend buying a round at the pub and for all the site options you've got with it, it's worth a look and bookmark. Clikc here to visit FS Templates for more information or a demo.